To make this craft first choose 3 different colors of paper (for the backround) We used prime colors, so this also became a lesson. Let it dry and while it is drying take 4 more pieces of paper. 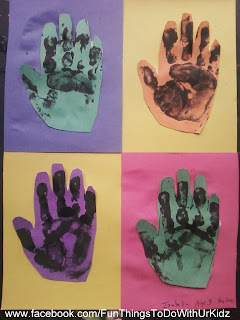 (we used secondary colors) and with black paint put one hand print on each. Once dry cut out around it. To finish glue the hand prints onto the paper in any order you want and done!